I was a little late at seeing the Bears' first 2017 preseason game. I had meant to record it Thursday evening and watch it later that night. Instead, my DVR recorded two hours of A Football Life instead of the game. I don't know if this was NFL Network's fault for airing the wrong show, or if it was Century Link's fault for mislabeling the schedule. In any case, I had to wait to record the re-broadcast later Saturday morning and watch it Saturday night. I've been pretty vocal about my confusion with the Bear's offseason quarterback decisions. While I wasn't sorry to see Jay Cutler kicked to the curb, I was very unsure about signing Mike Glennon. I was even more dumbfounded by the Bears' decision to trade up to draft Trubisky after having already spent all that money on Glennon. Glennon didn't give fans reason to be optimistic, as his preseason debut went about as bad as it could possibly go. 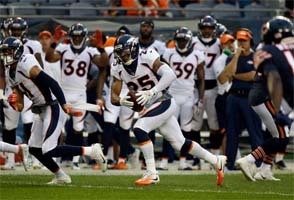 His second pass of the game was intercepted by Chris Harris Jr. and returned for a touchdown. Mike Glennon's second pass was intercepted by Chris Harris Jr. and returned for a TD. In Glennon's defense, the offensive line wasn't doing him many favors. He seemed to be getting hit every time he dropped back. While Chris Harris Jr. was high-stepping the pick into the end zone, Glennon was peeling himself off the turf. If the Bears want Glennon (or any quarterback they decide to field) to be successful, then they're going to need to beef up their protection. Cody Whitehair, in particular made a key mistake by snapping the ball over Glennon's head during the Bears' second possession. The ball was recovered by the Broncos, but the Bears' defense managed to hold them from scoring. 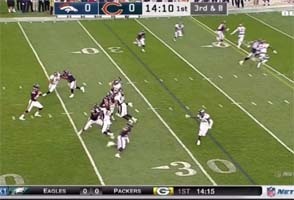 The Bears' third drive was where they were finally able to move the ball for the first time in the evening thanks mostly to their running game. Jordan Howard only got a few runs, but rookie Tarik Cohen made some pretty good runs that may earn him some extra play-time and maybe a spot on the final roster. Down 10-0, Glennon ended his night in the early second quarter with only two completions on eight attempts, with the pick-six and a quarterback rating of 0.0 -- yes, that's zero point zero! You know, I haven't talked much about the Bears on this blog lately. In fact, I don't think I talked about them at all in 2015, despite a lot of shake-ups in the organization. But then again, those shake-ups are kind of the reason that I didn't talk about the team. I wasn't really sure what to think about it all - let alone what to say (publicly, over the internet) about it! Another factor in my silence about the team was a lingering sense of disillusionment with the organization. By 2015, the Bears were no longer the same team that I had grown up loving. Lovie Smith was gone, replaced by an offensive-minded head coach who failed to turn Jay Cutler into a superstar. My favorite players, Brian Urlacher and Devin Hester were gone. Even other players that I had liked, such as Charles Tillman, were gone. John Fox is responsible for rebuilding the Bears into a respectable team. Last year saw John Fox take over for the failing Marc Trestman, and the Bears have been in rebuilding mode. Management hasn't been afraid to shake up personnel. The Bears traded away veteran workhorse Matt Forte to the Jets, and (surprinsingly) traded star tight end Martellus Bennett to the Patriots this offseason. Both moves make sense. Forte's age is a concern, especially for the demanding role as a workhorse running back. Bennett had also been vocal about displeasure with the team. The Bears had even given up on linebacker project Shea McClellin, and released him. He was later picked up by the Patriots as well. I'm sure that both Bennett and McClellin will probably thrive under Bill Belichick's tutelage. Still can't get rid of Cutler though. 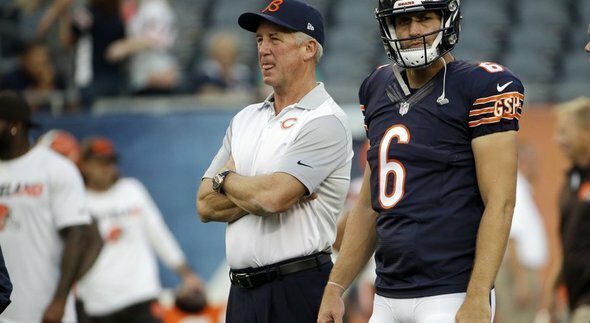 It seems like each new coach or coordinator comes in and thinks they're going to turn Cutler into a start. So far, they've all failed. A few months ago, I wrote a blog piece about suggestions to expand Madden 16's feature set to make the game a deeper, more realistic depiction of the management of an NFL team. This year's Madden game has proven to be a much better game than the previous few years, and I actually have found myself playing it well into the new year. As such, I've also been coming across new, nagging annoyances, and new ideas for features and enhancements. Most notably, I finally got to play through a complete off-season, and I have several ideas for how offseason can be improved in future years of Madden. So I've decided to write a follow-up piece with more suggestions for future games. This article will focus on off-season activities. In order to keep things clean and concise, I've also made a few changes to the original post as well. I wanted to keep specific topics grouped together. There's also less to talk about in this new post, so I've moved the "Little Things" section from the original post into this article in order to shorten the original post and pad this one out to about the same length. I've also made some small revisions and clarifications in the original post, so I highly recommend re-visiting that post to see the changes. ADDED: JUNE 5, 2016: Think you could've drafted better? I've been really dismayed by the focus that EA has placed on its Ultimate Team feature in the past couple years of Madden releases. I've made my distaste known in my reviews of both 16 and 15. With the NCAA football series dead due to the revocation of the license, Madden is all we have. I feel like the best thing for me to do at this point is to just give up, since it seems that EA has no interest in appealing to the small demographic of simulation die-hards to which I belong. Instead, they want to keep their model of annual releases that force people to have to give up their established decks of Ultimate Team cards so that they can spend more money on micro-DLC to buy the credits necessary to rebuild their collection. But as cynical as my reviews can be, I don't want to give up on football gaming. I love football, and I love gaming, and I want to continue to be able to enjoy the union of the two. And right now, Madden is the only way that I can do that. So I'm going to take some time to write up a wishlist of the kind of features that I want - no expect - a modern football game to include. Some of them are new features that football games have never attempted. Others are ones that previous games just never got right. And still others might be things that were present in earlier games, worked just fine, but have been inexplicably removed to make room for less worthwhile features. Blocking assignments and "hot blocks"
Delayed kneel down and "rugby punt"